In a village just outside modern-day Calcutta, a young girl sendsÂ her baby floating down a sacred river towards an unknown destiny. Over the years, the river, the golden chain found around his neck, and the hand of fate will link the life of the Baby Karna to that of a host of other characters; his teenage mother, Koonty; his half-brother and rival, Arjuna; his destitute foster mother, Dolly; as well as ruthless street thugs, politicians, pariahs and film stars. In this enchanting novel, which dips luxuriously into the richeness of Indian myth and Hindu legend, Sara Banerji thrills us with the twists and turns of Karna’s life. full of tragedy, surprises and strange coincidences, it takes us on an exhilerating ride from the Calcutta underworld, to Bollywood, up into the Himalayas and culminates – as the brothers’ fight for fame and fortune reaches the point of no return – in a race to the death which only one can win. Shining Hero won an Arts Council of England Award. 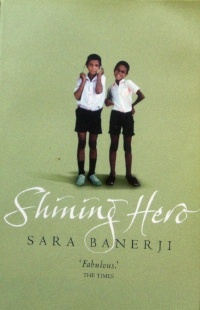 Update – March 2013: HarperCollins brought Shining Hero out again on ebook and POD.